Gone are the days when you need the help of a physical crank mechanism every time you need to raise your trailer. 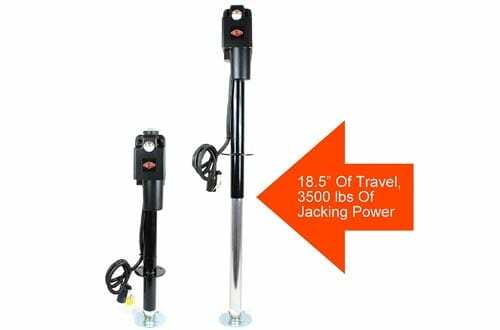 With electric tongue jacks, you can have all the convenience and advantage of effortless raising even for your heavy trailers of RVs. 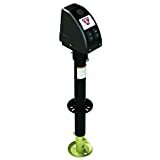 Do not sweat more behind the physical efforts as the electric tongue jacks are technologically advanced and raise your trailer easily with just a push of a button. It takes much lesser time and negligible efforts from your end, a win-win situation in every direction. So if you have decided to get one for your trailer, do you know which model will suit you most? Which one serves your purpose in the right way? 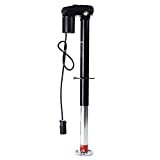 To help you, in this case, we have created a detailed and carefully narrowed down article featuring the top rated best electric tongue jacks. Give this a read and you will be able to choose the right one for you. 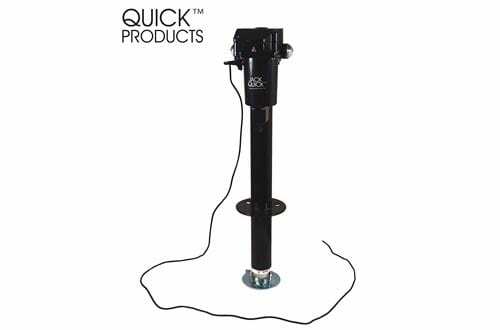 Lifting the car effortlessly is extremely easy with the JQ3500 tongue jack from Jack Quick. It is smooth and efficient, runs on the vehicle’s 12V electric supply and has a weight capacity of 3650 pounds for reliable working. The heavy-duty hardened steel gears ensure smoother working and durability at its very best. Furthermore, you get 2.25-inch post for most A-frames along with 18 inches of travel space, readily making your job easier. The electrical components in the jack are water resistant as well. LED working lights for improved efficiency at night times. Easily accessible top crack manual override. Comes with protective vinyl cover and plastic gear housing for better durability. This is a Bulldog jack which has a huge lift capacity of 4000 pounds for enhanced working pleasure. 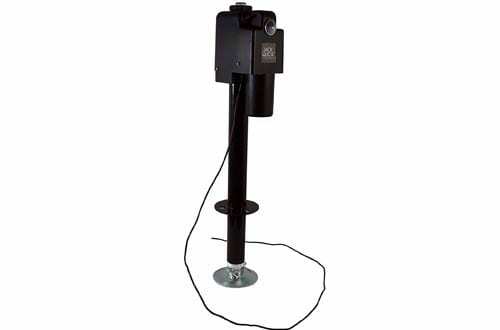 It comes with a spring loaded-drop leg pull pin that combined 14 inches of travel space and 8 inches of drop leg, readily making easy to access even in the presence of a weight distribution. 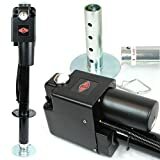 Moreover, in this jack, you get the benefit of 3 LED lights that make it easier for you to work even during night times as it illuminates the coupler area. Comes with an emergency manual override for stress-free operation when the battery is dead. 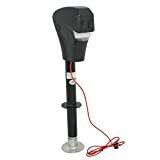 The Goplus electric tongue jack is by far one of the strongest and most durable models of tongue jacks. It features exceptionally durable hardened steel gears and combined with a black powder coat finish that saves it from rusting as well as corrosion. 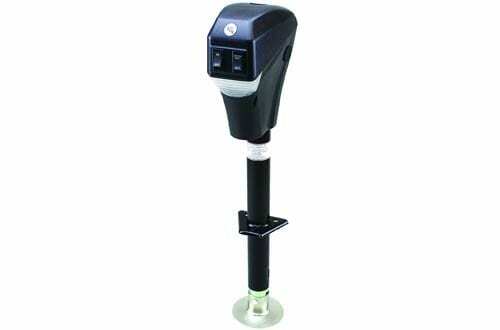 Working with this tongue jack is extremely easy as it can be installed quickly and easily and can be used with the 12 V electric supply of your car. All instructions for usage comes packed in the package for better working. Dual side LED light construction for unloading at night times. 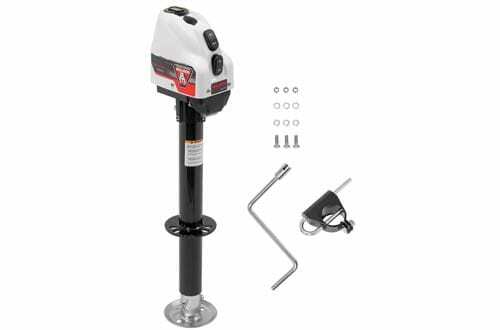 The smart, efficient and technologically advanced power jack from Husky is certainly a fine product and comes with really impressive as well as topnotch features. To start off, you get a huge weight lift capacity of 4500 pounds combined with the trust of hardened steel gears and reliability of soldered connections. 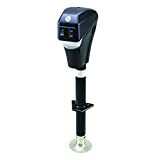 The 12V operation allows easy working with the power outlet of your car while 6 inches drop-down leg reduces time and effort in terms of setting the jack. 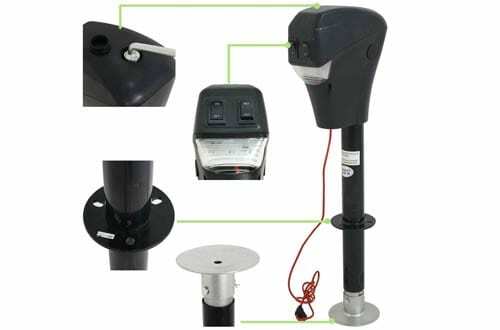 It also reduces risks regarding wear and tear on the motor and comes with a built-in connector storage bracket, which efficiently protects the ends of the cord from weathering. It features a ball-screw mechanism that reduces friction. To light up spring bar and hitch area, you get LED illumination from 3 sides. Convenience at par excellence with the tongue jack from Lippert as his model has some really impressive and stand out features to make your job easier each and every time. It comes with electric levelling technology that allows you to level the car at just the push of a button. Also, it has a large weight lifting capacity of 3500 pounds and 30 AMP rating for better performance. The 18” stroke is an added benefit whereas the textured casing on the outside assures protection against chips and cracks. Last but not the least; you get amazing illumination from the power of 4 LED lights which is quite excellent. The gears are helically designed to reduce noise, clutter and enhance operation. Designed to eliminate manual cracking efforts. Reduces working time and efforts. 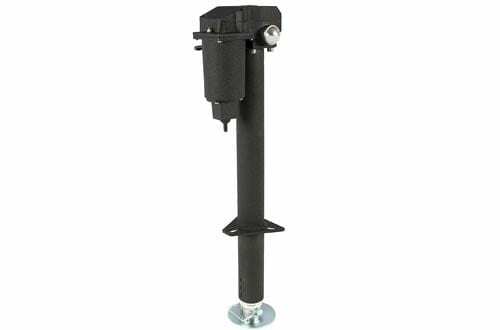 This model of tongue jack features an amazing design comprising of a composite housing to save any damage even when used in the worse of weather conditions. It has the ability to raise your car to an impressive elevation of 18.5”. 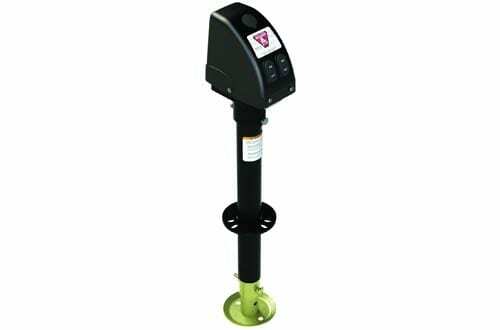 Since it is made up of hardened steel gears on the inside and capable of lifting weights up to 3500 pounds with ease, you will never have to worry about its durability. To make your job easier, this jack also features built-in LED lights for effortless working even at night times. Comes with a pre-wired design with 7 pin connector, easy to set up. It has a wide range of application and works fantastically well for vehicles and as it has a huge weight lifting capacity of 3250 pounds. 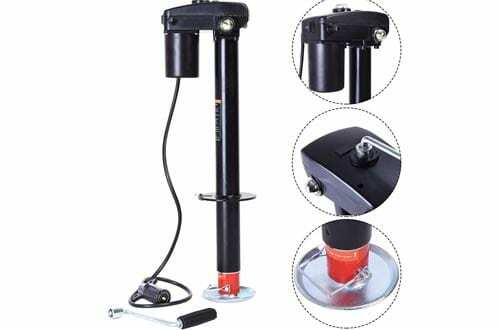 The presence of hardened steel gears enhances the workability, efficiency and also durability of the tongue jack. Also, you get a protective vinyl cover that also has a zinc plated foot. The 18″ allows hassle-free attachment along with a long-lasting construction makes this an amazing choice. Fits all A-frame tongues f 2.25-inches. 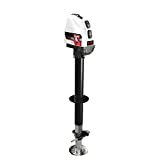 The stand out feature on this tongue jack is the outstanding lift height which stands at 22”, as the 8” drop leg height maximizes the raise. Having a weight lifting capacity of 3500 pounds, this jack can lift many and most of the heavy vehicles without any issues. Furthermore, in the Bulldog tongue jack, you get the advantage of having LED lights that are angled to illuminate the coupler, thus making night time issues much friendlier. Extremely easy to deploy and hook up. 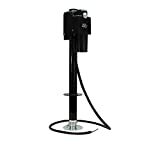 The Best Choice Products tongue jack happens to be a jack that has impressed a huge consumer base with its unmatched reliability and functionality. It is very easy to use as it is rated at 12V, thus you can connect it to your vehicle directly. Plus, you have the reliability of the powder coated rust resistant steel for non-stop working in varied weather conditions. 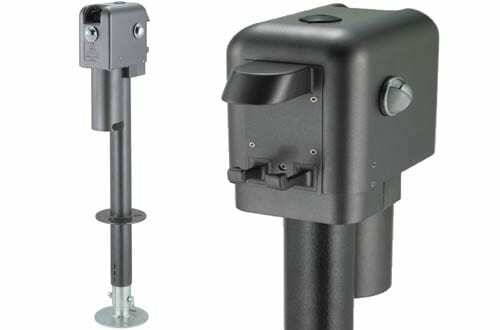 The 3 bolt mounting ensures durability at par excellence as well. Sitting at the very top of the list, this tongue jack from Zeny is a reliable and trustworthy model for its exceptional features in every direction. Firstly, the 3500 pounds weight capacity is quite impressive and it also offers the advantage of an 18” lift along with the trust of hardened steel gears. This jack fits all standard A-frames and has a long lasting and low maintenance construction for enhanced convenience. Detachable hand cracks for emergency purposes. Powder coated finish to prevent rusting. 3 bolt mounting and removable foot pad. So these excellent electric tongue jacks are just what one needs. Gain beneficial results when you vouch for the best.